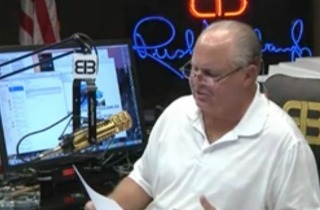 This has been a tough week for Rush Limbaugh. The conservative radio host spoke about America’s “all-out assault” on the Confederate flag on Wednesday, blasted the Affordable Care Act’s approval on Thursday, and on Friday, he said that the Supreme Court’s ruling in favor of gay marriage meant that the words of the Constitution no longer have meaning. After touching on the Obamacare ruling and the “leftist agenda” as he went on, Limbaugh brought the discussion to Star Trek actor George Takei, saying that even with the SCOTUS ruling, LGBT activists will never be satisfied until their view have been impressed upon everybody. Nobody in the heterosexual world is forcing anything on anybody. They’re minding their own business and having something forced on them, is what’s happening here. So Mr. Takei says: Hey, you’re free to have your religious beliefs. Have them all you like. I have mine, too. But you can’t impose your religious values on to others. But Mr. Takei and his group can impose their beliefs on you all day every day or you will lose your business.